For the past year I have had the fortune to work with Ed Greenspon, the Public Policy Forum, and a wonderful group of scholars and journalists on a report on the state of journalism in Canada. The resulting report was recently released, The Shattered Mirror: News, Democracy and Trust in the Digital Age. My role was mainly to support the analysis of digital journalism both in Canada and within the broader platform (Facebook, Google, etc) ecosystem. I hosted a workshop in Vancouver to dive specifically into the challenges digital start-ups face in Canada and I attended many of the roundtables that the PPF hosted across the country. I learned a ton, and while I don’t agree with everything in the report, i think that it represents the most detailed current assessment of the state of the industry in Canada, and some of the recommendations, if adopted, would lead to significant transformation of the digital journalism space in this country. The site for the report is here and a PDF can be downloaded here. First, virtual reality challenges the ways in which journalists think about representation. At the core of VR’s unique power is a deception–that the user believes she is experiencing something she is not. The goal of journalism in VR, therefore, is to inform the user by blurring the act of journalistic representation. But journalists cannot appropriate the physiological power of virtual reality without also thinking seriously about how leveraging it for journalistic purposes changes the way the world is represented. Last year I was fortunate enough to get to attend a remarkable workshop at the University of Sidney lead by James Der Derian. It was part of a workshop series and documentary project that James is leading called Project Q: Peace and Security in the Quantum Age. The goal of the project is to bring together a broad range of interdisciplinary scholars, (physicists, biologists, philosophers, political scientists, artists, poets) to explore the potential implications of a second generation of quantum science. James is better than anyone I have ever encountered at developing creative and thought provoking conversations and his documentary about this project is going to be remarkable. This article builds on the summary remarks I made at the Q3 workshop, and explores some of the potential implications of various strands of quantum science for international peace and security. The promise of quantum science has always been epistemological. It changes how and what we know. As a second generation of quantum technology comes online, three critical questions raised by and explored through Project Q are critical. The first is whether quantum technologies will prove emancipatory or will reconcentrate power in the hands of states. At the Q Symposium, Professor Michael Biercuk, an experimental physicist and director of the Quantum Control Laboratory at the University of Sydney, pointed out that “new technology drives radical social change.” If we are going to take seriously the proposition that quantum could be disruptive, let alone emancipatory, then we need to ask who are the nimble outsiders developing these technologies to take on legacy institutions, and at what point will access to these technologies be democratized and available to the many in ways that challenge existing structures. It is far more likely that the early stages of the deployment of the technology will benefit incumbent actors. Take the case of quantum positioning and quantum communications. On the one hand, these technologies have the potential to dramatically increase military capabilities. On the other hand, they could also profoundly empower individuals, providing new levels of privacy and agency if they trickle down into the public sector. For example, the tech journalist Patrick Tucker has suggested that quantum location technologies could potentially provide a replacement for the GPS in phones and hand-held devices, allowing them to run offline and perhaps keep the location data out of the hands of carriers or snooping government agencies. But power is often zero-sum. And it is worth assuming that the interests of those developing these technologies will determine who is empowered by them. Observers also need to ask who is competing to get these technologies, and is there a tension between and within emerging strategic alliances. As Biercuk pointed out, the research has moved from “things to study to things to exploit,” meaning there will be real competition for capabilities that can be monopolized. There is a profound tension between the spirit of cooperation (the U.S. government and Silicon Valley, International Research labs) and the opportunities for strategic, scientific, and commercial gain: a confluence of interests that has led commentators to warn of an impending “quantum arms race.” We may have lost the window for a truly international project because the incentives for commercial and security gains are too strong. Along with the United States and China, Australia, Russia, and United Kingdom all are involved in the global race for quantum computing. Third, and perhaps most important, it is time to begin thinking through how the world will govern emerging quantum technologies. In order to control the digital space, one needs both data and the tools to give them meaning. With meaning will come control and power, which opens up a wide range of governance challenges. According to Jairus Grove, director of the University of Hawaii’s Research Center for Futures Studies, quantum technologies pose a “direct challenge to democratic decision-making and accountability.” As government agencies seek to collect “the whole haystack,” as the former NSA chief Keith Alexander once put it, and utilize increasingly algorithmically oriented forms of governance to rule their citizens, how do we ensure that even more opaque quantum algorithms are employed responsibly? As a limited number of states and corporations seek fault-tolerant quantum technologies to exploit a decisive military advantage, they will surely change the ways in which we think about power and control in the international system. But even beyond shifts in power, so-called quantum social theory could be used to help researchers metaphorically and empirically understand social phenomena. In a new book on quantum theory, Alexander Wendt, a professor of political science at Ohio State, argues that although classical physics cannot explain concepts such as consciousness, perhaps thinking of collections of human minds as a quantum machine, and subject to the emerging scientific knowledge of quantum phenomena, can scientifically ground our understanding of social collectives. Quantum science could change how we know the world. 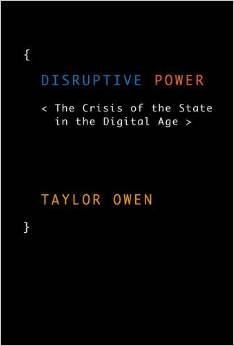 will first and foremost require a rethinking of the approach to online governance. It means addressing the misalignment between our international institutions and the actors and technologies that currently have power. The status quo governance discourse delegitimizes many of the emerging actors with real power, and because of this it is blind to some of the core policy challenges of the 21st century. It also means assessing what new technologies or socio-technological processes currently sit utside of our international governance structures. Algorithms, autonomous weapons, quantum computing and cryptocurrencies all exist in ungoverned spaces that fundamentally challenge the legitimacy and authority of the state. What does governance in this rapidly evolving space look like? Finally, taking digital foreign policy seriously means moving beyond siloed digital foreign policies. The idea that surveillance policy, digital diplomacy, autonomous weapons development and digital humanitarianism can be discussed in isolated departmental silos is absurd. They all intimately effect each other, are based on the same data flows and algorithmic tools, and contradictions between them seriously harm our credibility and impact in the world. Put another way: What does a Whole of Government Digital Strategy look like—one that addresses surveillance, IP, C-51, dual-use technologies, cyber war, autonomous weapons and online finance? Taking this question seriously, with all of the complexities it entails, is a pre-requisite for for any country seeking to engage with responsibility, legitimacy and continued relevance in the emerging global digital system. Coin Toss: Will blockchain undermine or buttress state power? The book is at its best when explaining the complex concepts underpinning blockchain, but ultimately falls victim to an irreconcilable conflict at the heart of the blockchain movement—the growing divide in the cryptocurrency community between those who want to normalize its use and those who remain steadfast in its revolutionary potential. Put more starkly, while some view blockchain as a more efficient tool for financial services, market exchanges, online purchases and information sharing that can be adopted by established actors, others see it as a fundamental challenge to the hierarchical nature of power itself. These two visions of blockchain cannot coexist. I was on The Agenda with Steve Paikin a couple of weeks ago to talk digital technology, power and some Canadian foreign policy. We got into both my Disruptive Power and The World Won’t Wait books. At the end though, I was asked about Trump. My answer relates to Brexit as well though. The growing desire to burn down the house stems in part from a failure of governments to deliver on their promise & rhetoric to large segments of society. This, in turn, is because states have diminishing power to control citizens and events. Their monopoly over collective action is over. While much of the resulting nihilism is manifest in the right, this is a particular challenge for the left, who’s central proposition is deeply rooted in the role of the state. The need for an ambitious and forward-looking Canadian international strategy has never been greater. 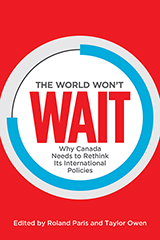 The worldwide changes that jeopardize Canadian security and prosperity are profound, ranging from the globalization of commerce, crime, and political extremism to the impact of climate change on the economy and environment. The reaction from Canada’s policymakers, at least so far, has been underwhelming. In The World Won’t Wait, some of Canada’s brightest thinkers respond. Covering both classic foreign policy issues such as international security, human rights, and global institutions and emerging issues like internet governance, climate change, and sustainable development, their essays offer fresh and provocative responses to today’s challenges and opportunities. The proposals are striking and the contributors diverse: Toronto’s chief city planner makes the case that Canada needs a global urban agenda, while a prominent mining executive explains how to revitalize the country’s position as a world leader in the sector. Their essays are sure to spark the kind of debate that Canada requires if its international policy is to evolve into the twenty-first century.